Inspired by the Victorian tradition of a coin engraved with sweethearts' initials, our contemporary version let's her carry your love, close to her heart. Whether parting for a few months or weeks, or even just a few hours each day, a personalised Token of Love shows her how you feel. 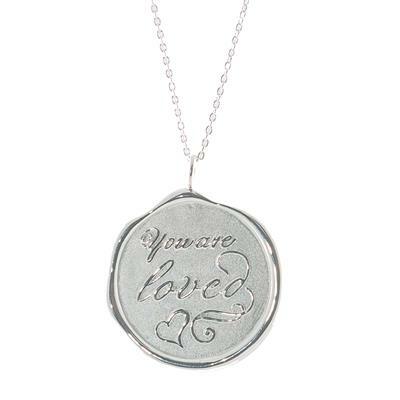 Choose from 5 romantic designs, each one personalised with your combined initials on the reverse (enter your two intials at the checkout, either R&A or R.A) made from 925 Sterling Silver on an adjustable 16-18inch chain featuring the 'You Are Loved' design.